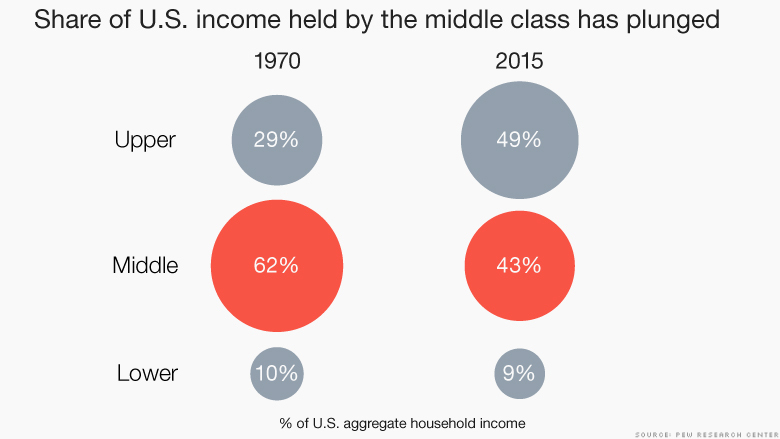 Middle class Americans now comprise less than half, or 49.9%, of the nation's population, down from 61% in 1971, according to a new Pew Research Center report. For Pew, middle class Americans live in households earning between two-thirds to two times the nation's median income. In 2014, that ranged from $41,900 to $125,600 for a three-person household. 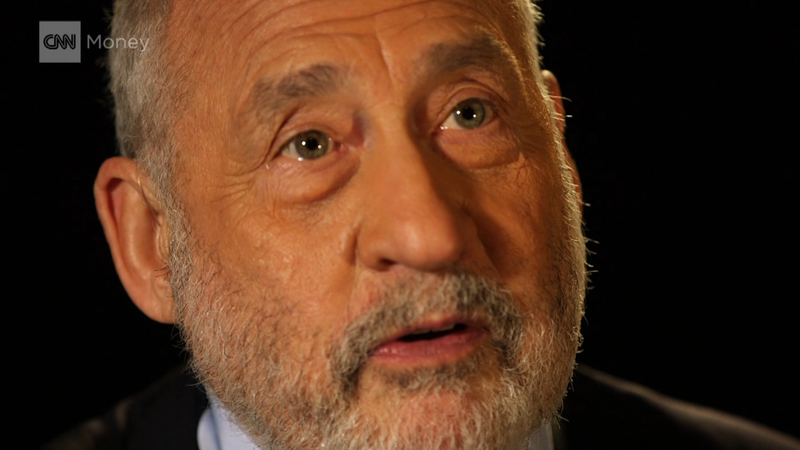 For decades, the middle class had been the core of the country. A healthy middle class kept America strong, experts and politicians said. But more recently, these residents have struggled under stagnating wages and soaring costs. Presidential candidates on both sides of the political aisle are campaigning on ways to bolster the nation's middle class and increase opportunities to climb the economic ladder. The steady decline of the middle class is yet another sign of economic polarization, said Rakesh Kochhar, associate director of research at Pew. Not only are more Americans shifting into the upper and lower classes, but they are moving into the higher range of the upper class and the lower range of the lower class. This is yet another sign of growing income inequality, he said. "There are fewer opportunities that place people in the middle of the income distribution," Kochhar said. One silver lining, however, is that more people are moving up the ladder than down. The ranks of the upper class are growing faster, according to Pew's research. Senior citizens were most likely to have shifted into the upper class since 1971. The share of Americans age 65 and over in the upper bracket increased nearly 27% over that time. Married couples with no children and black Americans also saw larger gains. Those most likely to fall into the lower class were those with only a high school degree and high school dropouts, as well as unmarried men. Here's another sign of how growing income inequality is squeezing the middle class. Since 1970, upper class households saw their median income soar 47% to $174,600 in 2014. Meanwhile, the middle class only got a 34% boost to $73,400. Still, they have been more prosperous than the lower-income Americans, who only received a 28% bump to $24,074. Some research shows that increased income inequality and a hollowing out of a nation's middle class stunts economic growth, Kochhar said. Looking at it another way, the upper class now controls 49% of the nation's aggregate income, up from 29% in 1970. 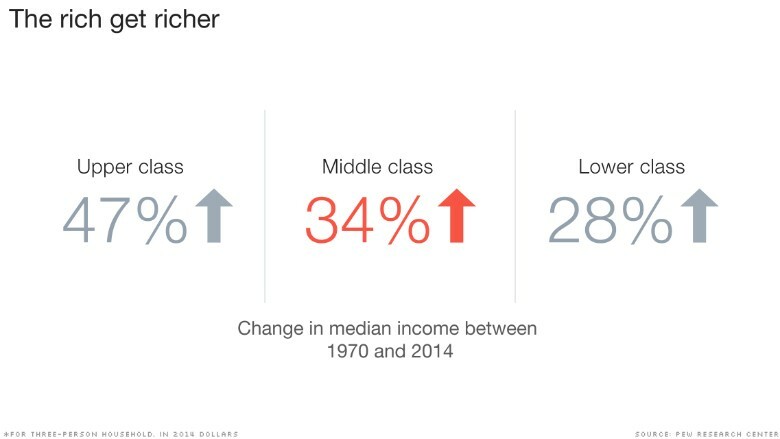 The middle class used to earn the largest slice of the nation's income. It held 62% in 1970, but that share has since fallen to 43%. The lower class, meanwhile, holds 9% of the country's income, just under the 10% it earned in 1970. 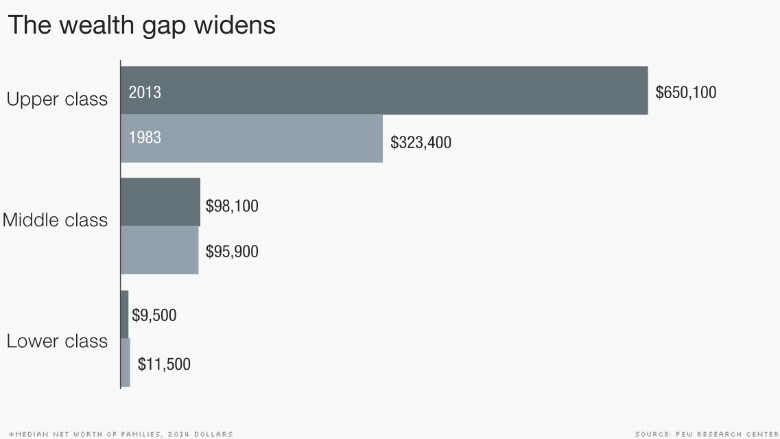 The rich are not only trumping the middle class in terms of income. They've also seen their wealth soar over the past 40 years. The median net worth of upper class families doubled between 1983 and 2013, up to $650,100. But the wealth of the middle class has increased a near negligible 2% over that time to $98,100. At least they fared better than lower-income Americans, who saw their wealth drop 18% to $9,500. For its wealth calculations, Pew used data from the Federal Reserve Bank's Survey of Consumer Finances, which defines net worth as all of a family's assets minus all their debts. 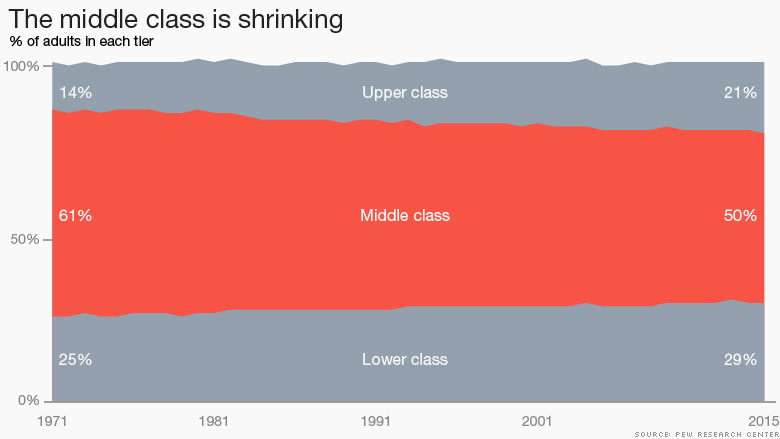 To check if you are middle class, check out Pew's calculator here.